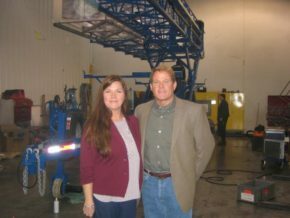 When Pat Dandridge (pictured above with President, Cyndi Mitchell) had the opportunity to expand his business and relocate the refurbishment facility, Catawba Regional and Park Sterling Bank jointly assisted with a total funding package to include land, building and the additional 30 acres. Anderson Crane & Bridge Technologies, Inc. provides hydraulic equipment for under bridge access for such jobs as under bridge construction, inspection, and bridge restoration. Fifteen jobs are expected to be created as a result of this project.